Justin Verlander turned in a performance for the ages in Game 2 of the ALCS. It took him 124 pitches, but Verlander pitched a complete game against the Yankees, allowing just five hits to lead the Astros to their second consecutive 2-1 win and a 2-0 series lead. Of course, the Yankees have been in this position before. In the ALDS against the Indians, the Yanks were down 2-0 and came back to win the series, so they will not be down, knowing that they’ll have the home crowd behind them for the next three games. Nevertheless, Monday’s Game 3 is a virtual must-win for the Yankees. Aside from outstanding performances from Verlander and Dallas Keuchel, you have to be impressed with Houston’s defense during the first two games of the series. 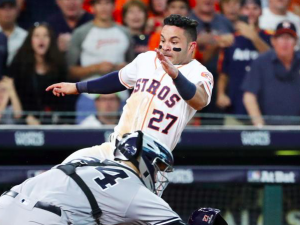 In Game 1, Marwin Gonzalez made a perfect throw to home plate to prevent Greg Bird from scoring. In Game 2, not only did Josh Reddick take away a possible home run, but he also threw out Brett Gardner at third base trying to stretch a double into a triple. When Jake Marisnick went down with an injury late in the season, Houston’s outfield defense could have been a weakness in the postseason. But that has not been the case. Considering the Astros have won the first two games of this series by a single run, those defensive plays have all been massive in giving Houston a 2-0 lead. The Astros will look to put this series on ice with help from Charlie Morton, who will get the ball in Game 3. Morton pitched fairly well in Game 4 of the ALDS, going 4.1 innings and striking out six, allowing two runs on seven hits. However, his leash was relatively short, so you have to think Astros manager A.J. Hinch will be satisfied with four or five innings before letting the bullpen takeover. In a start at Yankee Stadium in May, Morton had mixed results, striking out 10 but giving up four runs over 5.2 innings. That may give Hinch more pause to let Morton go too deep in this game. In need of a win, the Yankees will look to C.C. Sabathia, something they did in Game 5 of the ALDS. Sabathia has been far from dominant in his two playoff starts, but he’s given the Yankees enough to keep them in games and give them a chance to win. Of course, Houston’s lineup presents a greater challenge than Sabathia faced against the Indians. If Sabathia can get the game into the 5th inning, knowing there’s a strong and fresh bullpen behind him, the Yankees will surely take it. Look for Matt Holliday to be an X-factor in Game 3. The Yankees are looking for offense anywhere they can get it. Both Aaron Judge and Gary Sanchez are hitting under .200 in the postseason and the Yankees still aren’t set on who’s going to be the DH from one game to the next. After missing out on the ALDS, Holliday is back and the mix and the kind of veteran hitter the Yankees need to make an impact. In his career against Morton, he’s 9 for 34 (.265) with two home runs and a double. Only Todd Frazier and Starlin Castro have many at-bats or as much success against Morton among Yankees hitters. Holliday could end up being a key figure in helping the Yankees get back in the series. The Yankees have been great at home this postseason, and Sabathia has been to grind out a couple good starts. That’ll be enough to get the Yankees a win and get them back in the series. The Yankees should be able to get to Morton and give their bullpen the chance to protect a lead. New York wins 7-4.